Are We Duped By the Technium? This is the first flag I feel I could fly with unalloyed pride. Now all I need is a lapel pin version. The flag was designed by James Cadle. Prior to the US landing on the moon, there was hope a flag for humanity, rather than the American flag, would be erected on the moon. Some hoped the UN flag would fly, but that never happened. 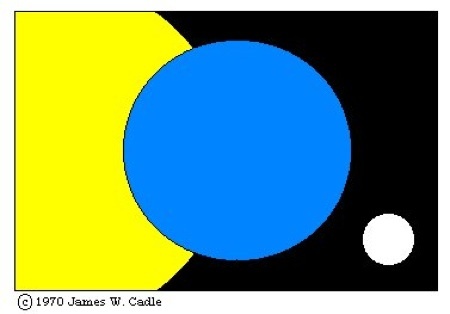 Some time later, James Cadle, who lived on a farm in rural Illinois, was inspired by this debate to create the Flag of Earth. It is intended to be used for ANY purpose that is representative of Humankind as a whole, and not connected to any country, organization, or individual. James made it his life’s work to promote and distribute this flag everywhere. He and his wife made the flags on their kitchen table, and sold them for what it cost to make and distribute them. The Flag of Earth is often flown at locations doing SETI work in order to indicate that the search is the “work of humanity and not a specific country or organization.” Cadle died in 2004, but he left the design in the public domain, bless him. At the Flag of Earth website there are templates for printing them out or purchasing ready-to-fly sown ones. I like it. It would be beautiful to have such thing, something that unites all us.